Hey, Tooth, You CAN Be Replaced! If a tooth’s viability is compromised from deep decay, advanced gum disease, or trauma, you may find yourself faced with the decision to extract it. Likewise if you have a root canal tooth shown to cause problems. And as if that decision isn’t difficult enough, you’ll also need to decide how you’ll replace it. If the tooth’s in the back, not between two teeth, you may not need to do anything. Otherwise, some kind of replacement will be recommended. Without them, your teeth may drift into the newly open space. This can affect your bite, your appearance, and your speech. One option is to replace the tooth with a fixed, metal-free bridge. It will look, feel, and function like natural teeth. Non-metal bridges have a long and good track record, but there’s a downside. A bridge replaces a missing tooth by anchoring onto the two teeth on either side. If those teeth are currently healthy, they’ll need to be reduced and fit for crowns that abut the false tooth. 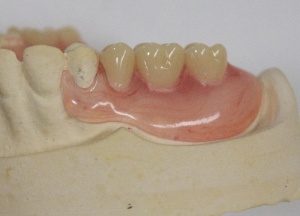 While newer designs such as Carlson and Maryland bridges drastically reduce the amount of natural tooth structure lost, you’re still having to do procedures on healthy teeth in order to place the bridge. Additionally, some craniosacral therapist believe that bridging the teeth together prevents the natural ebb and flow of teeth. Restricting the movement can stress the teeth and their related meridians. As their name suggests, removables can be taken out for cleaning. A single removable bridge can replace several missing teeth, on both sides of the mouth, which makes it ideal for people missing multiple teeth. It’s also a good option when there’s severe bone loss or lack of gum, lip, and cheek support due to missing teeth. 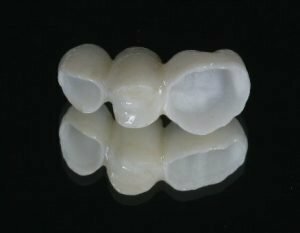 The materials used to make today’s partials are increasingly lightweight, flexible, and biocompatible. With some, even single-tooth partials are an option. Made from titanium or zirconium ceramic, implants are trending as the “popular” recommendation of conventional dentists. Placing them is a surgical procedure and, thus, not a decision to take lightly, no matter how hard a dentist may try to sell them. More and more, professionals see articles like this one, where implant dentistry isn’t presented so much as a treatment option but a lucrative growth opportunity for any practice. You just need to have “excellent scripting…to motivate patients,” they say. The best time to educate patients about dental implants is before they actually need them. It then becomes an assumption rather than a decision. We don’t think patients should assume anything about any treatment. We don’t believe in scripting to sell dentistry. We believe in sharing information, all of it, and empowering you to make the best choice for you. Are implants ever a good choice? They do look and function like natural teeth. They may even enhance chewing function in some cases. They don’t require the sacrifice of healthy teeth as a bridge does. Ceramic implants appear to be broadly biocompatible and have a low affinity for plaque formation. Because they’re metal-free, they can’t generate galvanic currents. 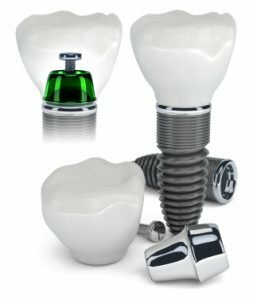 Although titanium is the preferred choice for dental implants as it is an inert material, if used in oral implants, it may encourage toxic or allergic type…reactions. Allergy due to titanium might be accountable for the failure of implants in come cases. Furthermore, the insertion of titanium implants and their presence in the human body may also cause internal exposure which ultimately leads to titanium ions to concentrate in tissues, regional lymph nodes, and pulmonary tissue. Do the research. Gather all the information you can. Weigh the pros and cons of each option for use in your particular situation. Know the percentages of success and failure over time. Evaluate all the materials that will be used. Take your health history and long-term health goals into consideration. Keep asking questions that are important to you. Don’t rush into a decision. Your socket needs time to heal anyway. Trust your gut. You know yourself better than anyone. Talk to your doctor, but when in doubt, get another opinion.